Harry Potter Night is almost upon us! 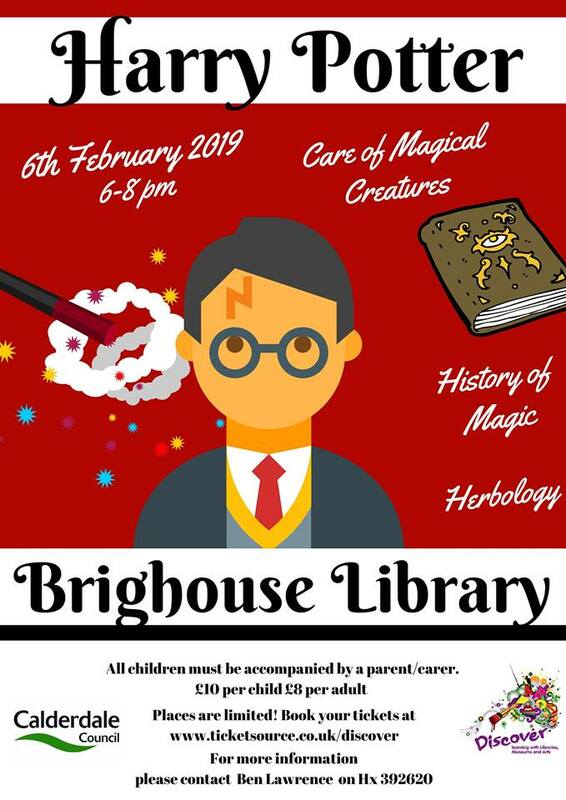 Join the Brighouse Library Team on Wednesday 6 February in the imposing and impressive Brighouse Library for a night of magic lessons and fun and games. Choose your house and take part in four Hogwarts lessons. Please note, all houses will take part in all four lessons, including Slytherin! Explore Fantastic Beasts with the amazing ZooLab! There will be a History of Magic with Professor Binns. Help Professor Sprout re-pot mandrakes and spend half an hour in the world’s best place for a free period, Gryffindor Common Room. Make sure you come dressed as your favourite character. There will also be opportunities to guess how many Bertie Botts Every Flavour Beans are in a jar and come face to face with the Fat Lady and guess the Gryffindor Common Room Password (£1 per go). Recommended for children age 6 plus. For more information contact Ben on 01422 392620. This is a not for profit event, all the money raised through ticket sales go towards putting this fantastic event on. Not to be missed! This entry was posted in Brighouse, Events, Feb, Young People and tagged Brighouse Library.